Are libraries about to start "thinking locally"? Has a beloved children's book figure regressed in time? Is that furniture-sized appliance with spools of tape actually a computer? And what new and forthcoming books are starting to get "buzz"? We consider all of these questions in today's Sunday Brunch. The Chinese word for "crisis" is composed of two characters. One stands for "danger" and the other represents "opportunity." I first read that over thirty years ago in THE SON OF SOMEONE FAMOUS by M.E. Kerr, an author who has continued teaching and entertaining me ever since. Anyway, it seems to me that our libraries are about to face a crisis. Due to the popularity of e-books, the good old-fashioned BOOK (the kind with pages and a cover) appears to be going the way of the dinosaur. At least that's the case at the library where I work. On Friday I learned that, while the number of patrons coming into our library is increasing, the number of books being circulated is getting smaller and smaller. Ten years ago we circulated over 500,000 books per year. Last year we were down to 100,000 circulations. The experts say that we will eventually level off at 20,000 books circulating per year. When I heard that, a siren and flashing neon light went off in my head ("Danger, Will Robinson!") and I pictured libraries following in the footsteps of the record stores and bookstores decimated by modern technology. But remember the line about "danger AND opportunity..."? The experts now tell us that one of the things that will save libraries is a switch in focus. Libraries will now find new life in archiving LOCAL history and events. My own library is already taking steps in this direction and I've heard that many others are following suit. 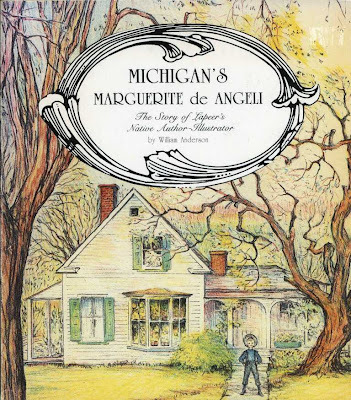 Published by the Marguerite de Angeli Library in Lapeer, Michigan, MICHIGAN'S MARGUERITE DE ANGELI includes biographical material, an interview/conversation from the author's 90th birthday celebration, family photographs, paintings, and material written for, but not included in, her novel COPPER-TOED BOOTS. It also contains a complete bibliography of de Angeli's work, noting where the original manuscripts for many of these books can be found. I thought this was an excellent example of a library focusing on local resources. Let's face it, except for a few major figures, monographs about children's authors don't have much of a market. 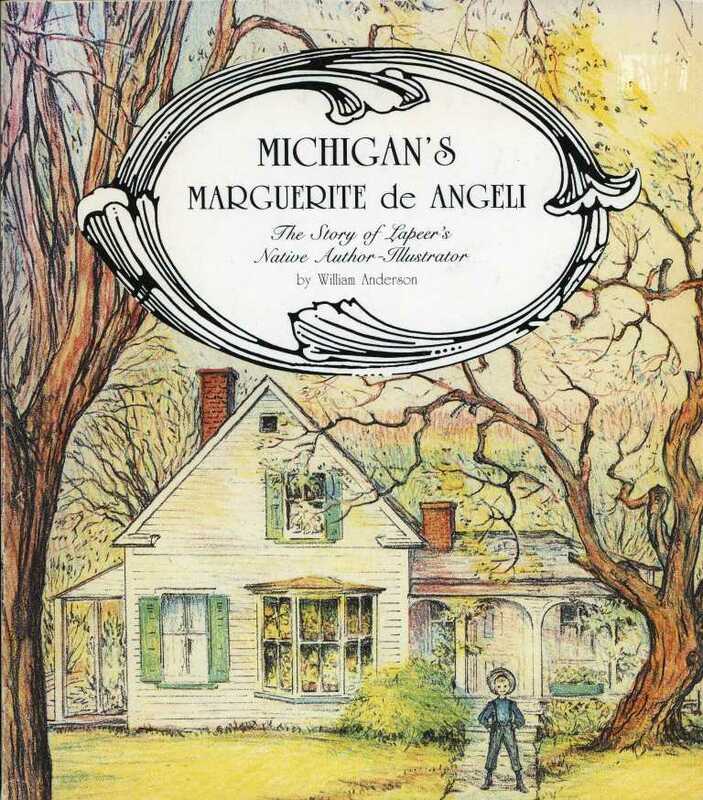 Marguerite de Angeli may have been one of the most notable children's writers of the twentieth century, but she's not particularly well-known these days except for her Newbery-winner, THE DOOR IN THE WALL, and perhaps two or three other titles. Yet researchers, writers, teachers, and critics will always have an interest in this author -- and who better to continue her legacy than the library in her hometown of Lapeer, Michigan? This may be one role that libraries will fill in coming years -- creating books, online exhibits, and historical archives about local children's authors who may otherwise be lost to history. I don’t know much about him but he did live down the street from me when I was growing up. He gave my sister and I some of his books. He wrote inside the cover of each of the books, personalizing each of them for my sister and I, and drew beautiful unique watercolor artwork and signed them. I have three first edition books. Unfortunately the matching paper book jackets were damaged by smoke in a house fire that we had in 1999. But the books themselves survived and are in otherwise excellent condition. Palmer Brown lived with his mother in a white stone house covered with ivy in the tiny little town of Oregon, Pennsylvania. [...] Long ago the town was called “Catfish”. Palmer Brown’s home was by the Oregon Hotel, which in later years has become Reflections Restaurant. I think he gave us the books as a Christmas present because my mom told him how much we loved to read. I remember trick or treating at his house one year. He was very quiet and you never saw much of him or his mother. But they were very nice people, very pleasant and sweet. Thank you, Cindy, for sharing these memories about the author of HICKORY and BEYOND THE PAW PAW TREES! Cindy's note got me wondering if anyone else had a famous children's author as a neighbor. If so, did you get to know them? Did you read their books? Although I now realize that yes, many writers live in regular neighborhoods and buy milk at the grocery store, I still tend to place them on pedestals. Many years ago I had a pair of friends in this area. Over the years, I occasionally accompanied them as they visited the wife's childhood home where her parents still lived. One day someone mentioned the neighbor, Mrs. Blos. I said, "There's a children's writer named Joan Blos." My friend said, "Yes, that's her. We grew up with her children. She won the Caldecott Award for one of her books." I was so shocked to think that someone I knew grew up just across the street from a Newbery-winning writer! My friend said, "Some day I'll take you across the street to meet her." Alas, my friends soon moved to Chicago and evetnually got a divorce, so I never did have a personal meeting with this famous author. Have you ever lived across the street or on the other side of the fence from a famous writer? Speaking of literary connections: Last Sunday I wrote about actress Susan Cabot whose real-life experiences rivaled any of the B-movies she made in the 1950s. She dated King Hussein until he realized she was Jewish...she gave birth to a dwarf...she dabbled in drugs and even took her son's growth hormone medication...she became a recluse...and eventually the dwarf killed her with a barbell. The reason I wrote about her is that she once illustrated children's books, though I have been unable to find any of specific titles. I still haven't been able to identify those books, but this week I did note an unusual literary coincidence. Francesca Lia Block's latest book, PINK SMOG : BECOMING WEETZIE BAT features the eponymous character who made her debut in Block's 1989 debut novel and several subsequent books. In those stories Weetzie grows from a teenager to an adult. However in PINK SMOG we move back in time, meeting Weetzie when she was thirteen-year-old Louise. Reading this book I became intrigued by the character of Weetzie's father, who works in the field of B-movies. Knowing that some elements of these novels mirror Block's own life, I paid a visit to the imdb.com and discovered that Francesca's father, Irving Block, really did work in the field of B-movies. In fact, he wrote the original stories for two movies starring Susan Cabot -- WAR OF THE SATELLITES and 1957's THE SAGA OF THE VIKING WOMEN AND THEIR VOYAGE TO THE WATERS OF THE GREAT SEA SERPENT. PINK SMOG works fairly well as a "prequel" to the "Weetzie Bat" series. However, I was recently unnerved when I discovered that another beloved children's book figure has also stepped back into time. That's Amelia Bedelia? A kid getting off a school bus? 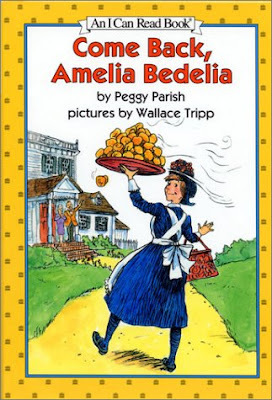 Amelia Bedelia was created by Peggy Parish, who based the character on a maid she once knew who always took comments literally. Introduced in 1963, this character starred in a dozen easy readers, sketching pictures of drapes when her employers told her to "draw the drapes" and sticking lightbulbs in the dirt when instructed to plant bulbs in the garden. Peggy Parish died in 1988, but her nephew continued the series beginning with 1995's GOOD DRIVING, AMELIA BEDELIA. However, in 2009 a major change took place in the series. 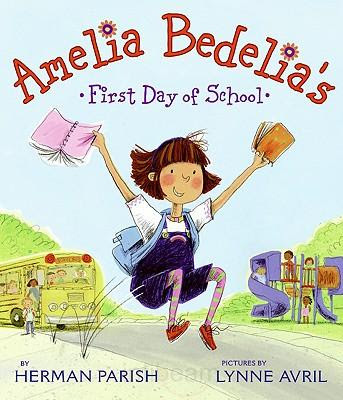 Instead of easy readers, the volumes are now often (though not always) presented in a picture book format...and, instead of being an adult maid, Amelia Bedelias is now a little girl. The idea is that we're now reading about Amelia's childhood -- an idea that doesn't quite work since the stories don't appear to revisit an earlier time period and Amelia is dressed in very contemporary fashions. It would be interesting to learn what kids think of this change in Amelia. Do they like her better as a kid? Can they relate to her more easily now? I guess I'm old school. There was something especially funny about seeing such a literal-minded adult...and it was comforting to see that, despite her "issues," Amelia Bedelia was so warmly regarded by her employers and friends. Now she seems just like just anohter silly, annoying kid and not nearly as individualized as she was in the adult volumes. What do you think about this change in Amelia Bedelia? It took many decades for the character of Amelia Bedelia to change. It took less than a year before GO THE F*** TO SLEEP changed. Please go the (bleep) to sleep. The illustrations have been slightly altered, and so has the text. The lambs have lain down with the sheep. You're cozy and warm in your bed, my deaar. 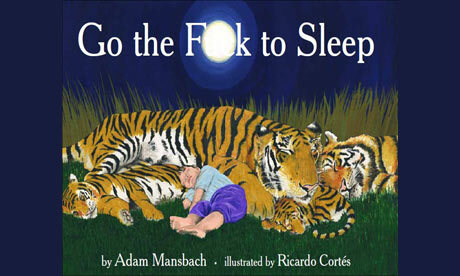 Please, just this once, go to sleep. Same intent, same overall meaning...but this time G-rated. 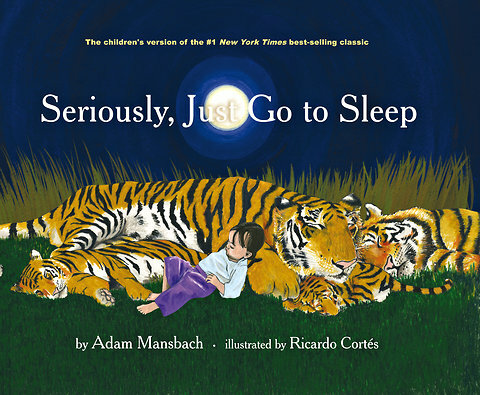 Though this version unlikely to get the same gut-level (often smirking and nodding) response from adults that the original edition did, this book can at least be brought into nurseries without the threat of a visit from Child Protective Services. Do you collect books by Edward Gorey? Last night I was watching ANTIQUES ROADSHOW and saw an appraisal for a colletion of Gorey books and stuffed figures that would make many children's book collector drool. Did you miss it? You can still catch it here. The $5000 value of that Gorey collection seems like peanuts when compared to the recent ROADSHOW appraisal of a signed first edition of J.R.R. Tolkien's THE HOBBIT, which was valued at between $80,000 and $120,000. You can watch that video here. Many people forget that THE HOBBIT was originally published as a children's book. Wandering through the library stacks this week, I came across an oldie by William D. Hayes -- HOLD THAT COMPUTER! Although I remember a few of the author's other books with fondness (PROJECT: GENIUS and PROJECT SCOOP), I had never read this title before. HOLD THAT COMPUTER! turned out to be a rather pedestrian effort -- a tired plot, flat dialogue, interchangable characters -- so it's hard to believe it was published by Jean Karl at Atheneum during the era of E.L. Konigsburg, Zilpha Keatley Snyder, and so many other luminaries. Of course at the time of publication, many kids were likely drawn to this title because of the topic, as baseball players Hank and his friends use the new school computer to figure out why they can't beat a rival team. The subject -- so new in 1968 -- is what really dates the book today, as the boys input info into a machine as big as a kitchen appliance hung with spools of tape. Predictably, it eventually blows up when facing off with another computer during the book's climax. Although this book is almost forgettable (how forgettable? I had to go back and look up the name of the protagonist even though I just finished reading the book yesterday) it is rather notable as an early story about computers. 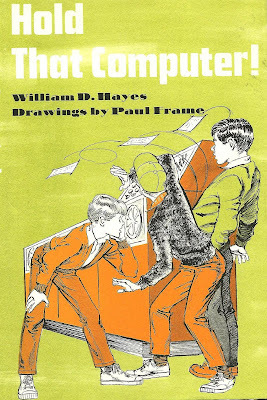 Can anyone think of any other children's books from 1968 or earlier that dealt with computers? Of course there were a few nonfiction volumes, plus references to computers in science ficton novels, but I'm hard-pressed to think of any other realistic novels that touch on the topic. I did find one, OLLIE'S TEAM AND THE BASKETBALL COMPUTER by Clem Philbrook, published a year later by Hastings House. Funny that two of earlist children's books to feature computers also focused on sports. Nowadays kids seem to play all their games ON the computer, rather than using computers to help them play better on the field or the court. Well, it took a week of lunches to finish up all my Easter egg-salad. But the holiday is still not quite over. That's because blog-reader ChrisinNY reminded me of my failed promise to read THE WICKED ENCHANTMENT by Margot Benary-Isbert. During a previous Easter blog I mentioned that many books are set in the days and weeks leading up to Christmas -- and sometimes even leading up to holidays such as Thanksgiving and Halloween. But I could think of very few books set during the Easter season. At the time, Chris suggested the Benary-Isbert novel as a good example, but the seasons passed and I never got around to reading it. This past week Chris wrote to say, "Last year you asked if anyone knew of books that centered on Holy Week and I suggested this title. I actually reread it every year in the weeks approaching Easter, and wondered if you had ever tracked it down and read it? It has a real sense of taking place in another country/culture/time, but has a lot of humor and fun too. If you ever get a chance, try it." Well, I don't have to be told twice (actually, I DID have to told twice! ), so this week I finally found a copy. I'll report back with my thoughts when I finish it, but at this point I'm really enjoying it. 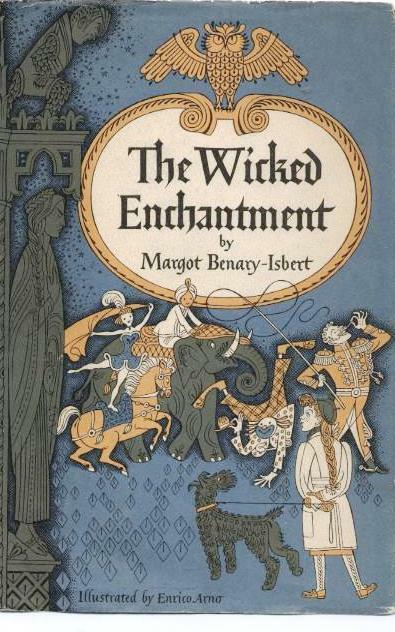 I believe this is the only fantasy that Margot Benary-Isbert wrote. She was mostly noted for writing realistic fiction about Germany during and after World War II. In fact, her best-known novel DIE ARCHE NOAH (published in the United States as THE ARK) was one of the first children's novels published in Germany after WWII. The book concerns a refugee family who turn an abandoned railway car into a home for themselves. The book was well-received by American critics though, from today's perspective, one wonders how any book about Germany and World War II could avoid mention of Nazis or the Holocaust...and the railway car seems a strange device considering how such cars were utilized during the war. Later books by Margot Benary-Isbert, such as DANGEROUS SPRING were much more unflinching in their portrayals of Nazism and the Hitler Youth. The author had experienced all these things first hand in Germany. Born in 1889, she was not allowed to publish anything between 1933 and 1945 because she refused to join the Nazi writers organization. In 1953, she and her family immigrated to the United States and became naturalized citizens. Her publishing career continued to flourish, although she continued to write in her native language and have the books tranlsated into English. Which titles are you hearing about? My mother was a typist when I was growing up, and typed at home, usually for court reporters (boring!) But one day she told me she was typing a manuscript for a Real Live Author! It was Elizabeth Spykman, who wrote chapter books about a girl named Edie, who was always getting into trouble. (Titles in the series include a Lemon and A Star, The Wild Angel, and Terrible, Horrible Edie) My mother was typing up Edie on the Warpath, and let me read some of the manuscript. Unfortunately, I was a little young and didn't quite get it, but was still excited and hoped to meet the author. One day when I went to breakfast my mom showed me the paper that had an obituary for Mrs. Spykman. I burst into tears - there went my chance to meet an author! I'll have to go back and read those books now! Thanks, Peter, for bringing up this memory for me. Your blog is great. I literally grew up across the fence from a famous illustrator . . .'s mother. I don't suppose that really counts, does it? But David Catrow's mom currently resides behind my childhood home. I worry that someday I will be at a function and David Catrow will be sitting there eating an egg salad (your post made me hungry for egg salad, Peter) when I leap out of the hydrangea to declare madly "I LIVED BEHIND YOUR MOOOOM!!!" I imagine his simultaneous look of disgust and horror will be enough to keep me in check for a good long while. As for the Newbery, just label me Team Twelve Kinds of Ice, though Wonder's clearly the frontrunner at this stage of the game. The One and Only Ivan seems to be coming up close behind Wonder in my personal buzzosphere. To draw out the story a little...I was reviewing a biography of Ursula K. LeGuin for SLJ, and I read that she is the daughter of the anthropologist Alfred Kroeber. I thought to myself, Huh, my grandmother grew up across the street from Alfred and Theodora Kroeber in Berkeley, CA. Then my brain kicked in, and I thought, "No way, that means my grandmother grew up across the street from Ursula K. LeGuin!" My grandmother is about 9 years older than Ms. LeGuin and remembers seeing her go off for her first day of kindergarten. I wrote a letter to Ms. LeGuin, not expecting any reply, and she was kind enough to write back, saying that she remembered my grandmother, and she hoped she didn't do anything too embarassing on her first day of kindergarten! What a great thread--I hope you get more stories. I'm very distantly related (on my mother's side) to children's author Wilma Yeo. My grandmother always told me that she'd arrange for me to meet Wilma, but it never came to pass. Since Jonathan Lethem is her nephew, then I guess I'm related to him as well. I don't care if our family ties are the skinniest of threads. I'll take what I can get when it comes to children's literature! Oops, forgot to register my displeasure about the de-ageing of Amelia Bedelia. I also loved The False Prince- stayed up late to read it two nights in a row. That just doesn’t happen often for this “needs sleep” kind of person. I am so glad I nudged you about The Wicked Enchantment. I read it first as a girl, so have that affection to fall back on. Not sure contemporary kids would like it as much- or if it speaks to an adult who reads it for the first time. As for older books that focused on computers- wasn’t there a Danny Dunn one about a homework machine? It has been too many years since I read it so I can’t be sure. Yes, Danny Dunn and the Homework Machine -- it was the only Danny Dunn we owned, so I read it many times more often than the others. It's the one where Irene moves in. I stayed up very late to finish Wonder, and definitely will be rooting for it. Can't wait to read The False Prince. I am looking forward to reading two young adult sequels coming out this year: Bitterblue by Kristin Cashore and The Drowned Cities by Paolo Bacigalupi.